This event is presented by the Centre of Research Excellence in Disability and Health and is supported by the Melbourne Social Equity Institute and the Melbourne Neuroscience Institute. 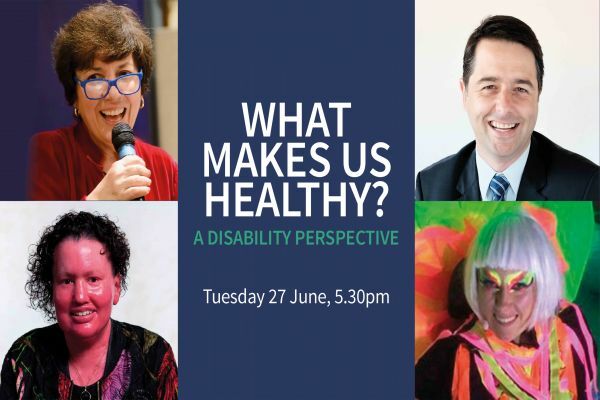 Join performer Emily Dash, journalist and appearance activist Carly Findlay, and Disability Discrimination Commissioner Alastair McEwin in conversation about what keeps us healthy and happy whatever abilities or disabilities we have. One in five Australians has a disability. On traditional indicators of health such as mental health and mortality, people with a disability have poorer health than everyone else. We know that people with disabilities often live on low incomes and have one of the lowest employment rates of all the OECD countries. So how does this level of disadvantage impact their health? Does disability equal poor health, or is it more complex than that? Join our dynamic speakers and MC Julie McCrossin for a conversation about what good health means from a disability perspective. The Centre of Research Excellence in Disability and Health will be formally launched by the Disability Discrimination Commissioner Alastair McEwin. Drinks and nibbles provided. The event is free, but registration is required. Emily Dash is a writer, performer and motivational speaker. She describes life as an ice cream 'often difficult, sometimes messy, but always enjoyable'. Her latest film, The Milky Pop Kid, will debut at the 2017 Sydney Film Festival. Carly Findlay is an award-winning writer and appearance activist. She writes on disability issues for ABC online, Daily Life and SBS. She has appeared on You Can't Ask That and Cyberhate on ABC TV. Carly is currently writing a memoir. Alastair McEwin is Australia’s Disability Discrimination Commissioner and has extensive professional experience in the disability sector with a background in arts, law and business administration. Julie McCrossin is a broadcaster and media personality and is well known for her warmth and instant rapport with audiences. This event will be Auslan interpreted and reserve seats will be available near the interpreters. There is a hearing loop in the auditorium which allows patrons who are wearing a hearing aid to tune in to the frequency of the venue. The best seats are in the front row. There will be live speech to text captioning of the panel discussion. Every effort has been made to ensure that the event is accessible for wheelchair users or those with limited mobility. We are happy to reserve seating to accommodate your access needs. An accessibility guide for this building can be downloaded here (Word document). The Melbourne Brain Centre building is accessible by a ramp located to the left of the entrance off Royal Parade, approximately 25m along the side of the building. Please contact the organisers if you would like to reserve seating or if you need help with any mobility or access requirements.